Looking for great winter color? This dense evergreen shrub offers up small oval silvery-green leaves that put on a red hue in winter. Silvery green, oval-shaped. Masses of red or hot pink tubular flowers emerge in winter through early spring and are irresistible to hummingbirds. From a distance, plants resemble sage plants in shape and color. 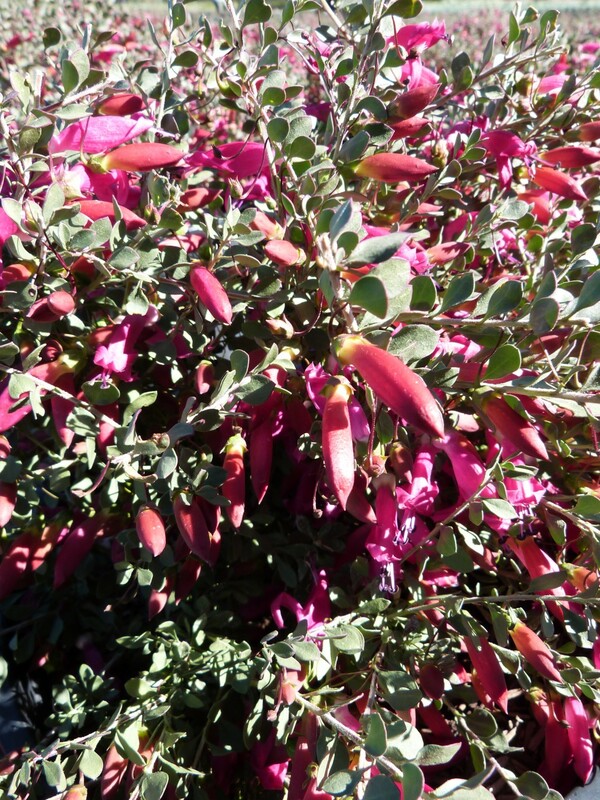 An Australian native, this hardy shrub can tolerate plenty of heat and drought once established. Plants develop their flowers on new growth, so it’s recommended that you shear or tip prune shrubs in late spring after they’ve finished blooming. Plants can also be grown as specimens in patio or entryway containers for a pop of winter foliage and flower color. Plants perform best in full sun conditions but will tolerate a bit of afternoon shade. Plants typically won’t bloom as much in shade. While Eremophila tolerates a variety of soils, from clay/alkaline to sandy loam, it needs good drainage to thrive. It’s best if soil dries between waterings. Once established plants do well with a deep soaking once or twice per month.